For decades Studio Ghibli have been entertaining people across the globe. A joy for young and old, their heart touching stories are conveyed through a unique and beautiful animation style that is nothing short of a pleasure to experience. Originally released in 1995, Whisper of the Heart is no exception to the animated mastery fans have come to expect from Studio Ghibli. 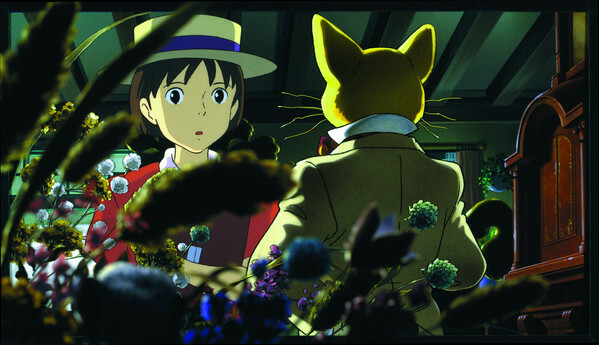 Adapted from Aoi Hiiragi’s manga of the same name by the talented Hayao Miyazaki, Whisper of the Heart is the first Ghibli film to be directed by someone other than Miyazaki himself. Yoshifumi Kondo took the role of director for what sadly, is his only film ever made. Luckily for us, Kondo’s masterful direction has been released in all its cinematic glory as a blu-ray disc, with extra bonus features for fans, new and old, to enjoy. A bookish young girl, Shizuku Tsukishima, spends her last remaining weeks of junior high with her head buried in works of fiction. As she attempts to read twenty books before summer is through, she starts to notice a familiar name appearing on the book’s library card, Seiji Amasawa. Through a series of seemingly coincidental events Shizuku and Seiji cross paths and discover their desired direction in life. 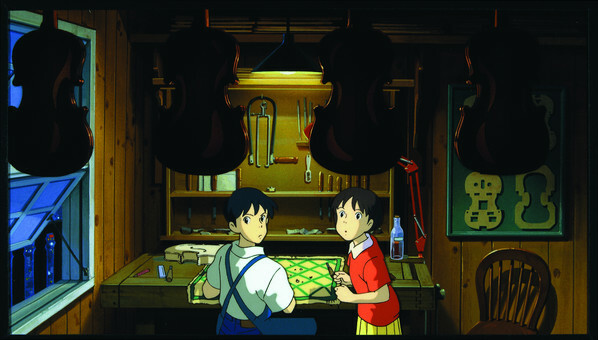 Seiji is destined to become a great violinmaker, while Shizuku wishes to become a writer. Unfortunately their paths pull them apart. But they are both determined to remain true to each other. As Shizuku tries to find the mysterious Seiji Amasawa from her library books, she finds her way into an antique store where she encounters Baron Humbert von Jikkingen. The Baron is a statue of a cat, wearing a suit and top hat. As the story progresses, and Shizuku strives to become the best writer she can be, her story brings The Baron to life, and also brings up long lost memories of love for the own of the antique store, Mr. Nishi. While Shizuku has a lot to learn about being a writer, she is dedicated to try her best in order to earn the respect of Seiji. Mr. Nishi critiques her work and gives her permission to use the story of the Baron and his long lost Baroness as the characters for her tale. At points, the story moves from the real world, to the world of Baron Humbert von Jikkingen, and also brings memories of the antique shop owner Mr. Nishi to life as well, much the same as Shizuku’s story does. The tales are beautifully weaved together and seamlessly create a narrative arc that stretches through out the film. 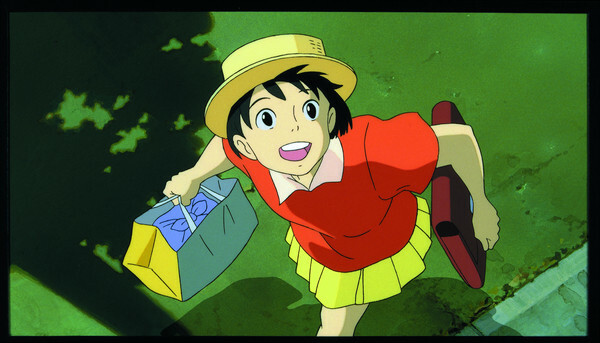 The story line is typical of Ghibli’s works: a coming of age story with a strong female lead. But this by no means makes it any less compelling. Intertwining stories of hopes and dreams, of love and density are beautifully conveyed through simple, yet heartfelt animation. 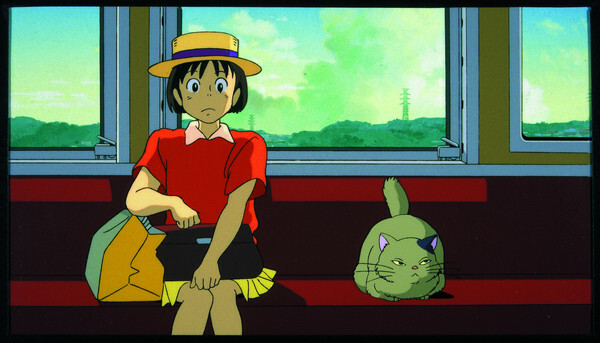 The visual style of Whisper of the Heart could be conveyed most accurately by Shizuku’s rendition of the song “Country Road”. Her lyrics read “concrete road, continuing forever, concrete road” and are used in the film to describe the children’s view of Tokyo. While the city of Tokyo may be the scene of the film and the lyrics may accurately describe Tokyo, Kondo, has transformed the city to be much more than a continuing grey road. The mundane elements: the subway, Family Mart and even stairs and streets are beautifully constructed to make a sprawling city, and indeed a self-contained world. The city isn’t conveyed as bleak, but as inspirational. These scenes of the ordinary are juxtaposed by leaps into the imagination of Shizuku through her creative writing. If the scenes of Tokyo are beautiful, then these are simply fantastic, with floating worlds and disproportionate landscapes. Shizuku and The Baron leap across this magical world hand in hand, and Kondo takes us along for the ride with them. If there is one flaw in Whisper of the Heart, it is the audio. Not so much the audio, but the repetition of one particular song, Country Road. This is the opening music to the film, and isn’t the best way to welcome you to the journey you are about to be taken on. That being said, when the credits roll and a Japanese rendition of Country Road begins to flow from my speakers, I immediately grow nostalgic and want to watch the movie all over again. Through out the film, there is a subtle soundtrack running alongside the brilliant voice acting, of both the English and Japanese actors. Sadly, the soundtrack itself is not spectacular, but does work well within the parameters of the film. Sadly, Studio Ghibili films seem to be lacking in special features on their DVD releases. Often they will include a Japanese cinematic trailer, and sometimes trailers for other Ghibili features. 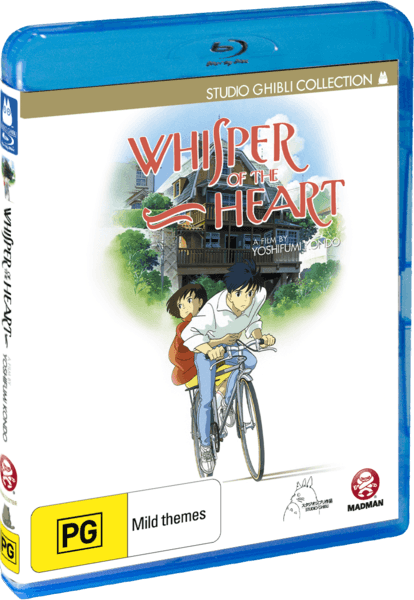 Ghibili fans will be spoiled for choice with this blu-ray re-release of Whisper of the Heart. The disc has both storyboards, and background art: giving insight into the artistic style that Ghibli fans have grown to love. There is also an emphasis on the soundtrack side, with an extended version of ‘4 Masterpieces of Naohisa Inoue: From Start To Finish”. There is also a short documentary-style behind the scene segment called “Behind the Microphone: Making of” which features the English voice actors talking about the process of dubbing the Japanese original. For English speaking fans such as myself, this was a real treat to witness the process of not just shifting languages, but also making sure none of the subtle nuances present in the original film are lost in translation. 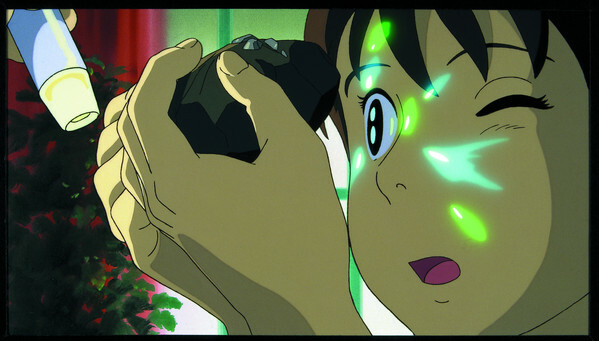 While it may not have an overtly fantastical plot or visual style and the soundtrack is a little lack luster in comparison to over Ghibli films, Whisper of the Heart still holds it’s own against some of the greatest animations to come out of Japan, nay the world! If you are a fan of Studio Ghibli, this will be a welcome edition to your collection. If you’re not, what is wrong with you? Whisper of the Heart is a beautifully composed and subtle edition to the Ghibli collection, and it is no surprise that director Yoshifumi Kondo was set to take on the leading role at the studio before his untimely passing away.